Many surveying instruments, due to the environment in which they were used, have degenerated from their original form. Many compasses, for example, have much newer needles than were originally fitted. A surveying compass from 1770, with a needle from a transit of the late 19th century, is historically misleading as well as offensive in appearance. 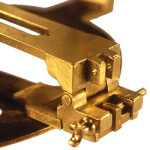 Sight vanes interchanged for expediency’s sake from one damaged instrument to another, disregards the fact that most compass makers had distinct patterns for their vanes and thumbscrews. To this end we supply replacement needles matched to the proper period and sight vanes remanufactured in accordance with each maker’s unique designs. 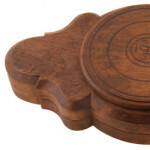 Compass restoration has normally been carried out in one of two manners. In the first case the restored pieces are left in shiny brass, waiting for time to age them to match the original. 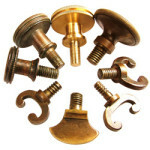 These replacement pieces are never signed or dated with the rationalization that the new brass makes it obvious that they are replaced pieces. Over the decades though, as the brass ages, the once blatant discrepancy between the old and new brass will blur and no longer present an obvious distinction. The second case deals with quality restoration without representation. Compass restoration completed in such a manner as to be virtually indistinguishable from the original, becomes an historical and ethical dilemma if not permanently labeled as such. We sign and date all large, replaced pieces. 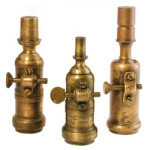 Colonial Instruments properly restores the functionality, as well as the original beauty, of early surveying instruments. It is our intention to honor the colonial craftsman by making replacement items commensurate with the standards to which they adhered. We retain the characteristics of the needles so they correspond closely to the instrument for which the needle is being made. In most instances, a maker’s needle style and dimensions have been documented and the replacement needle will be fabricated accordingly. 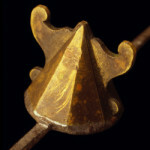 All colonial surveying instrument makers had unique design characteristics to their sight vanes. These seldom, if ever, changed throughout their working careers. We make the replacement sight vanes using our database of original manufacturers specifications thereby insuring accurate dimensions. 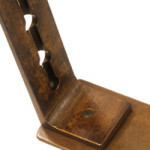 Colonial Instruments replicates missing pieces of extremely rare instruments such as the bow assembly for a bowcompass or unique folding assemblies of sight vanes. Adding a staff adapter to your instrument makes so much more of a visual impact and makes your rare instrument so much easier to display. Jacob’s staff adapters are available in a static, non-pivoting form and a gear-drive, fully functional form, as the original would have been. Colonial Instruments also offers an engraving service, including division of scales. We can replace missing or damaged horizontal or vertical circles with the proper numbering sequence and divisions for your instrument’s particular maker. Our tripods are made from thirty year old, air-dried cherry and are planed and chamfered completely by hand to give the same feel and appearance of an 18th century tripod. Colonial Instruments offers custom services such as replacement of missing thumb screws, needle lifting screws, and outkeepers. We also re-silver compass faces and install old glass (with appropriately aged glazing). 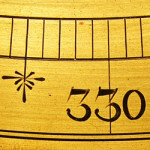 Colonial Instruments is continually working to provide new products for the serious collector of surveying instruments. 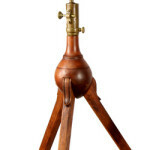 We are currently developing a line of reproduction 18th century tripods and field cases custom fitted to your instrument – contact us for further details and pricing.